An easy flower cake that looks classy makes a great gift for a friend celebrating any special moment. One of the easy cake decorating ideas that takes a minimal amount of time to decorate, this petal floral cake is one cake that will stand out. This easy cake was made for a family who had just had a new baby girl. They were delighted with how it turned out. The vanilla cake was filled with a strawberry jam and frosted with Swiss Meringue buttercream icing. 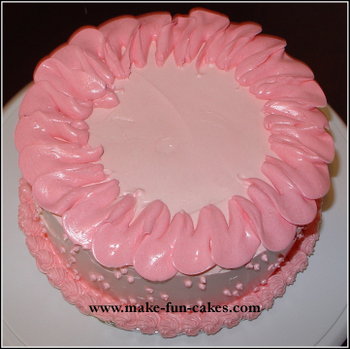 I chose a very feminine pink as the base color and then tinted the icing a shade darker each time I added a decoration layer to the flower cake. 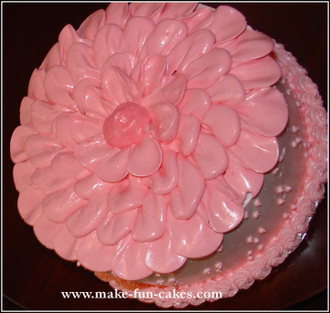 This easy flower cake can be completed in an hour. After the cake is frosted, tint the remaining frosting a slightly darker shade. 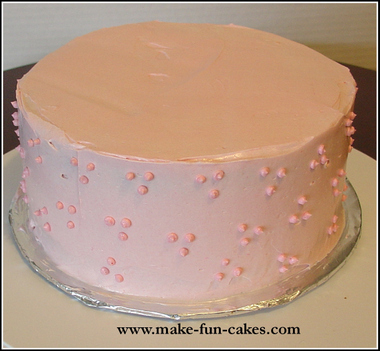 Use Wilton tip #6 to randomly pipe clusters of three dots on the sides of the cake. Use your finger to press in any points that linger. 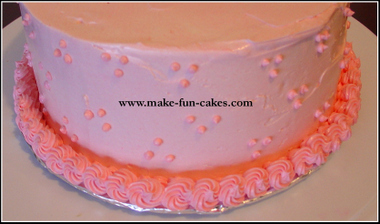 Make a rosette border with a shade darker frosting that was used to pipe the dots on the side of the cake. Using tip #18 pipe a shell border on the bottom of the cake. Using the same tip pipe rosettes on top of the shells. Layering the rosettes on top of the shells adds a little more dimension to the border. Once again tint the frosting slightly darker for the petals. 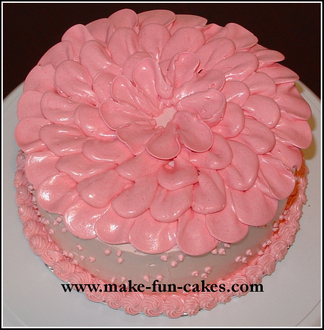 To make the petals on top of the cake, use tip # 127. This is one of the larger decorating tips. 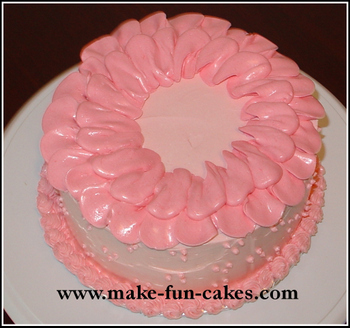 With the narrow end of the tip pointing down, make a petal on the outside border of the cake. Squeeze the frosting bag as you move the tip up and back down, forming a petal. Repeat until the petals are in a full circle. The next row of petals will slightly overlap the first row of petals. Pipe the petals in a complete circle. Repeat with the next circle of petals. Finally, tint the remaining frosting a shade darker. Using the opening of a decorating coupler, but no decorating tip, fill in the center of the cake, completing your flower. 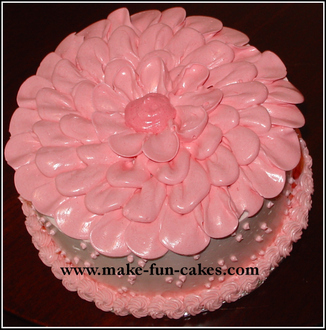 To add a bit more sparkle to the center of the flower cake, carefully dust with sugar or luster powder. This easy flower cake makes a wonderful baby shower cake, girls birthday cake, Mothers’ Day cake or friendship cake. Need more flower cake ideas? Click on the pictures to learn how to make these cakes.